JACKSONVILLE, Fla. -- Once again, WCWJ will honor the history, events and people during 2019 Black History Month. CW17 presents programs and special stories that will begin in January and run until early March. The programs praise the achievements of black Americans today as well as those who fought for our country. The events kick off at 10 p.m. Sunday, Jan. 20 on CW17 with the two-part documentary, "For Love of Liberty: The Story of America’s Black Patriots." Airing at 10 p.m. on Jan. 20 and Jan. 27, this two-part special salutes the contributions of African American men and women throughout our nation’s history. Hosted by Halle Barry, the documentary features the voices of Morgan Freeman, Lou Gossett Jr. and more. Jacksonville has a rich history in African American culture. Each day in February, WCWJ will air a short vignette, profiling a moment or person from Jacksonville that played a significant role in African American history. Special programming continues on CW17. 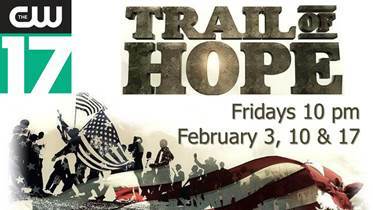 On Sundays in February, CW17 pays homage to the journey for civil rights in the three-part series, "Trail of Hope." The first installment, "Trail of Hope: Journey to Equality" premieres at 10 p.m. Feb. 3 on CW17. Then on Bounce TV, an all-star celebration of African American leaders at the 26th annual Trumpet Awards airs at 9 p.m. Feb. 17 on Bounce TV 17.2. Since 1993, these awards honor those who have achieved great things against huge odds. At 4:30 p.m. on Sunday, Feb. 17, the 50th Miss Black America Pageant airs on CW17. Celebrate 50 years with the Alvin Ailey dancers, African drummers and more as a new Miss Black America is crowned. The month caps off Sunday, Feb. 24 and March 3 at 10 p.m. on CW17 with "Mentoring Kings." This two-part special celebrates the national mentoring programs of celebrities, business entrepreneurs, educators and community leaders. "Mentoring Kings" also will air on Bounce TV 17.2 on Feb. 9 and 16 at noon.